I understand we need to be concerned about inclusivity. We need to wrestle with issues of power. As a church we need to worry about what voices are not being heard on all levels. If we want to make disciples of Jesus Christ for the transformation of the world, we need to be intentional about being a church for all peoples. As a church I know we are still struggling with the sins of racism, sexism, and others -isms that create a great deal of hurt on all levels of the church. There is much work to be done to ensure that everyone feels welcomed and valued as a part in the body of Christ. My guess is that welcoming and valuing all peoples is a never ending struggle that requires constant vigilance. Attacks on electing Bishop Webb as a white male were hurtful though to me for three reasons. The first is that inclusivity comes in many forms. Our annual conference (and the former Central Pennsylvania Conference before that) has not had a clergy person elected bishop since 1972. For forty years, no one from our conference has been consecrated to serve in that way. A voice from our annual conference has been missing for forty years on the Council of Bishops. As a conference we rejoice in Bishop Webb’s election and hope he brings a little bit of perspective from our corner of the world to the larger church. A second reason attacks on Bishop Webb’s gender and race are hurtful is that they are demeaning. They demean Bishop Webb as a person. As if he was only elected because he was white and male. The attacks demean the those who voted for Bishop Webb. As if they were voting based on fear and not because of discernment. It ultimately demeans the Holy Spirit. Was the Spirit not present at Jurisdictional Conference? Was the Spirit not working in the hearts and minds of those who were present? Are we so sure the Spirit made a mistake because Mark was white and male? The third reason this upsets me is that it is a double standard. Would those who demean Bishop Webb because he is white and male be cool with someone complaining that a bishop is not white and/or male? I would hope not. Bishop Webb could not help that he is white and male. Complaining about a person’s race and gender should not be acceptable under any circumstances. Now I realize that I am a white male United Methodist pastor. There is a lot of privilege that comes with being a white male United Methodist pastor. I am not arguing we should not be concerned about -isms. What I am saying is that we should not attack people based on their race or gender. As we struggle with inclusivity, we need to be careful about double standards. 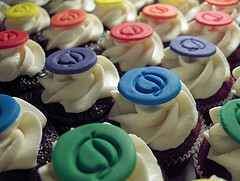 “Diversity Cupcakes.” ©2008 Copyright Clever Cupcakes. Licensed Under Creative Commons. Next Next post: More Punishment, More Problems?